Worlds is more than just an absorbing and, ultimately, heart-wrenching work of fiction, it is a visual masterpiece. Not since Wayne Barlowe's Expedition has an artist conceived an alien biosphere in such baroque detail, while remaining true to nature’s fundamental principles of adaptation, selection and ecological interdependence. These worlds are intricately conceived, their biomes scientifically plausible, while possessing a sufficient sense of the quirky and outrageous to mirror nature’s own outlandish inventiveness. Worlds is a visual depiction of humankind’s first exploration of life-supporting planets, shown in a dynamic vérité photographic style and told in a firstperson narrative. 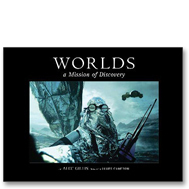 Created by Academy Award-nominated visual effects artist Alec Gillis, Worlds leads the reader on a journey to undiscovered landscapes, populated by unknown life forms. Worlds is a mission of discovery that becomes a struggle for survival, and in the process celebrates humanity’s spirit of exploration.